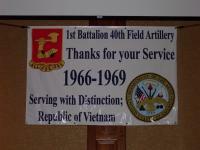 I was with 1st Battalion 40th Field Artillery with SVC Brty from May 1968 - May 1969. I drove a 5 ton fuel tanker delivering POL to firing batteries. I have recently reunited with some of my buddies: Al Watson, Jay "Fat Pappy" Barr, George Pauley and Jerry "Twiggy" Schmanski. I am looking for one more buddy to make the reunion complete...Tommy Jackson, if you're ou there, please contact me. Tommy was from South Carolina. Salute to you Gary from an old Marine. 1958-1962. I also drove a refueler, 5000 gallon tank.